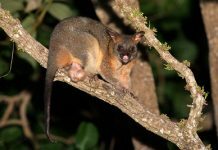 Possums are generalist feeders and the reason why they are so widespread is due to their flexible diet. They can digest just about anything from small insects, veggies, carrion to fruits. 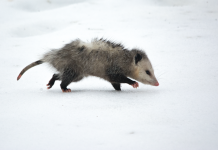 Possums are also known to consume snakes precisely due to their resistant nature to snake’s venom. However, we do not know as to how many species of snakes opossums eat a year. Possums are immune to most of the snakes. Even the most venomous rattlesnakes are not thought to threaten possums. However, not all snakes fall prey to possums. Bigger snake species likely prey on possums. Plus, possums do not fancy feeding on snakes. They will consume snakes only when they find one along their trail preferably the dead one. There are certain snake species that do threaten possums. The venom from elapid snakes is most likely to harm possums. Similarly, coral snakes can cause damage to the possum’s neuro cells. 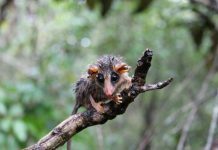 They aren’t only immune to snake’s venom—possums are probably the world’s only mammal that doesn’t appear to spread rabies.